It is probably worth explaining why images of ducks appear here and there on this site, on our Facebook page and in our Twitter feed and why people regularly (and often anonymously!) send us rubber ducks for our collection. In July 1989 we launched Dyalog for DOS/386, our first 32-bit version for DOS. As part of this product we supplied an auxiliary processor interface to the DOS/386 graphics library GSS*CGI. Despite his lack of any experience in the area, Pete Donnelly was asked to give a presentation on the new graphics capability. Undaunted, Pete bought a book entitled Introduction to the Graphical Kernel System (GKS). The first chapter included the co-ordinates for plotting a duck, and Pete used these to create a simple duck outline. These humble beginnings led to an graphical tutorial workspace that has graced nearly every version of Dyalog since 1990. 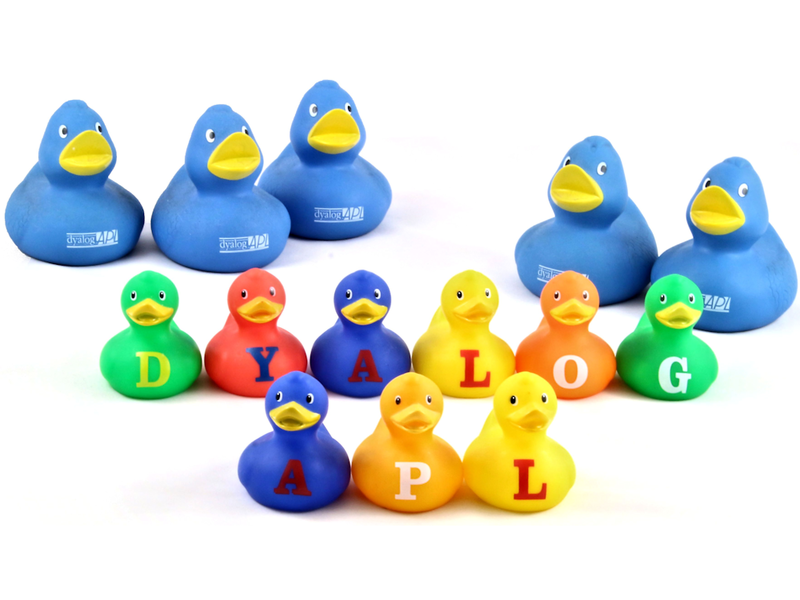 Our anatine friend has morphed into various guises to demonstrate new functionality as Dyalog has evolved, from OLE and .NET ducks to bouncing ducks (to illustrate multi-threading) and polychromatic rotating bouncing ducks as graphical capabilities increased. Before we knew it, the duck had established itself as the company's emblem – we reached a point when people complained if there were no ducks! 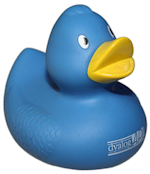 We even gave out little blue rubber ducks at our first user meeting (2003). Today, the duck tests are always one of the first tests performed on any new hardware. 2016 – The Year of The Duck! 2016 was an important year for APL as it was 50 years since the first APL workspace was created. The Dyalog duck motif has been around for more than half of that. Throughout 2016 we shared an image of different ducks from our collection each month. These images are also on our Twitter feed (#dyalogduckofthemonth) and Facebook page. We're launching the Year of the Duck with the Dyalog-specific section of our collection. The first duck that we gave away to attendees of our 2003 user meeting is represented here by the final five in our possession...congratulations if you are the proud owner of one of these limited edition collectibles! The individual letter ducks are behaving well for this photograph, but all too often they mischievously rearrange themselves on the shelf to spell various anagrams ("a pally dog", "a glad ploy", "all pay god", etc.). February is Dyalog Ltd's birthday, so it seems appropriate to feature the ducks from the birth of the collection. Although the duck that we adopted at the Wildfowl Trust (circa 1990) has almost certainly moved on to ponds new, quite a few members of the original collection from our old office in Alton are still gracing the bookshelves in Dyalog HQ. These stalwarts have survived office moves, mergers and acquisitions, and were brought back home when Karen and Andy returned to the Dyalog fold. Bookends, pencil cases, pots, boxes and ornaments – ducks have never been so versatile! Spring has definitely starting to show its head at Dyalog HQ with snowdrops and daffodils all around. Any day now we expect to see ducklings make their first appearance on the nearby river, so it seems appropriate to present our mother-and-ducklings bathtime ducks. These were an impulse purchase from IKEA by Karen in the summer of 2012 – along with 5 trollies of flat-pack furniture to furnish the newly-rented Dyalog house. The subsequent assembly of the furniture by the Dyalog developers is a story for another day…needless to say it was challenging! This month traditionally sees the launch of our annual student competition, for which we seek out interesting challenges that will encourage students to have a go and get involved with APL. Apparently our ducks haven't yet evolved a Unicode strain that supports APL385, so the more interesting APL expressions can't be demonstrated by our aquatic friends. They've made a good start though, and the glyphs that they do support allow some nice little #onelinerwednesday expressions; hopefully the students who enter the competition this year can show the ducks what they are missing out on. May sees Bernard Legrand's final "Introduction to APL" course taking place at Dyalog HQ as he has decided to finally retire and enjoy spending time with his family. Bernard's annual visit to our offices to initiate newcomers into the world of APL is something we all look forward to, and he often brings us a gift. One of those gifts was the duck featured this month – a very special one that deserves to have the spotlight all to itself. Bernard created it specially for Dyalog's collection in 2013 using the Raku ceramic burning technique. This month summer has definitely arrived at Dyalog HQ with lots of sunshine raising the temperatures. The air conditioning is on and there are plenty of knobbly knees on display as summer clothes make an appearance in the office! Even our ducks have been sending us their summer holiday snaps – did Elvis Duck take his Ducky Blues Brothers off to Las Vegas or was it just a visit to the sandpit in the back garden? The summer holidays are nearly here and students the world over can finally take a break from their studies...unless they have decided to take part in the annual Dyalog Student Competition of course! The clever student ducks that Brian Becker brought over from the U.S. have been working hard and are now able to quack in fluent APL; it looks like they have been raiding the Dyalog library too – here they are graduating in style and posing on top of the book that started it all. Four years on and it's time for another Olympic games – this time in Rio Di Janeiro, which is a slightly more exotic location than London in 2012. The athletes are ready and, as the eyes of the world turn to Brazil, the Dyalog ducks are getting in the Olympic spirit and proudly flying the flag in support of Team GB. Our Olympic Swimmer is looking wistful and wishing he was in Brazil and Duck-tania has gone all out with the red, white & blue although we aren't too sure about that hair do! These patriotic ducks were sent to us by our Mysterious Duck Sender who has, over the years, sent us a number of really cool ducks for the collection! We did eventually discover his identity – all is revealed on our Facebook page. Autumn is on the way and some say that our ducks should be thinking about migrating south for the winter – we think they look quite settled at Dyalog HQ and aren't planning on going anywhere! September also brings plenty of excitement and activity in the office with our annual user meeting happening in October. Dyalog '16 is taking place in Glasgow so maybe the ducks will join us and fly north instead? Last year a little duck carved from volcanic residue came back with us from Dyalog ’15 in Sicily and APL Germany user meetings have resulted in two Berlin ducks (well, a duck and a duck-bear hybrid!). Will they be joined by a McDuck from Dyalog '16? With Dyalog '16 over and everyone back in the office, the ducks have started to look forward to the end of October and Halloween. In some countries children traditionally dress up and go from door to door showing off their costumes in exchange for sweet treats and, not to be left out, some of our ducks have decided to dress up too. Let's hope they don't overdo it on the sweets and candies! This month we celebrate diversity with a group of very unique individuals who just don't fit into the other collections. Every single one of these ducks is a vital part of our collection and include Star Wars ducks, charity fundraising ducks, ducks made from glass, nanoblocks and ceramic, ducks with flowers, spots and flames and even ducks that light up in water. We really aren't fussy and welcome all different types of duck to come and roost at Dyalog HQ! Q. What do you get if you cross Santa with a duck? If you have a duck that would enhance our collection (!) we're always happy to introduce new friends to our growing flock – ducks can be posted to us in the U.K.